1 hour till Christmas. Today I didn’t need to remind my children to sleep because they want to wake up early to……open the presents. First my children and I wanted to surprise papa. We had a plan. 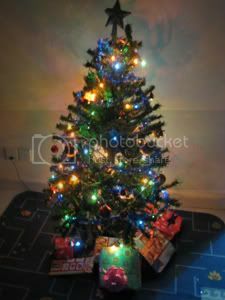 We wanted to set up the Christmas Tree when papa is asleep on the night we returned from KL. All three of us were trying to keep the secret. When we arrived, papa picked us up from the airport. Both of them were giggling. We headed for lunch. Emily was telling papa this and that and opps secret let out. Hrmm…she asked papa to erase it from his memory. After lunch, we headed home. Guess what, papa surprise us with the Christmas tree all set up. Both of them went urghh…because they really want to put up the ornaments. Maybe next year. To all mybabybay readers, have a blessed Christmas & great New Year! Merry X’mas to u and your family, Mich! So you and papa both have the same thought while you were apart.. haha.. romantic ker what? merry christmas & happy new yr to u and family! Merry Christmas n Happy New Year to you ……..